©Barry Sandland/TIMB – Photographing a cyclist at a demonstration where police were present brought its immediate intimidation. Photographer’s notes: I took this photo late last week at a demonstration less than a kilometre from the European Parliament and under 100 meters from the American Embassy. That said, it is a major intersection in Brussels and quite in the heart of the city’s movement. The rider only had a couple of minutes to spare, so the shoot was accelerated. That said, as I was taking the handful photos in total, a police officer, dressed in the full riot gear, baton in hand, came cross and told us, in a very stern, authoritative voice, to move on. Leave. .. It took another minute to start packing up but the police officer had already returned. Now, we were well behind the police, as seen in the photo, and we were not interfering with their action. We were simply looking at the demonstration and talking together (and taking a photo or two of the rider). But it was made very clear to us. People are not allowed to look at demonstrations. We would not be able to interact with the demonstrators. There would be no public recognition, tacit support for either the demonstration, or the right to demonstrate. The public would be moved along. We were done, the rider rode off and I finished getting my affairs in order – and felt some considerable pressure to move on. As I was about to leave, a second police officer came and asked if I were taking photos of the police and that was not allowed. I was pre parted for this. I told him, yes, I was taking photos, but that I took photos of the rider and did so with his written permission. But this is the second police interruption is a worrying aspect. That the public is not allowed to photograph the police in the course of their jobs. Now, let me be clear. I believe a police officer who is simply on the street, doing their job, is permitted privacy. There is no reason to identify an officer unnecessarily. That said, it does mot mean the police can insist that no photos of they activity be taken. However the police have a way of presenting a blanket refusal to anyone taking photos. That they can simply instruct a person to take no photographs. Period. If this seems a little out of place, I worry that the police behave like their counterparts in the USA, where they seem to think they can act beyond reproach – or, at least, if there is no photographic trail, they can act with denial. Photographing police in the course of their work, especially where there is adversarial interaction with the public, must be protected. I do think that riot police at a demonstration is, at its least, adversarial. Telling the public to move on, that they cannot remain at the site of a demonstration, is adversarial. Documenting the presence of police, in their position or number at an event, should not be something the police can protest. Certainly identification of a police officer who has done nothing incorrect should be protected. There is no reason to know a specific officer is at an event. But anonymous photography is not something that is, nor should be, limited. I did a search and it is certainly legal to photograph the police. Yes, you are allowed to photograph police officers USA link…. Photographer arrested in Belgium link here…. 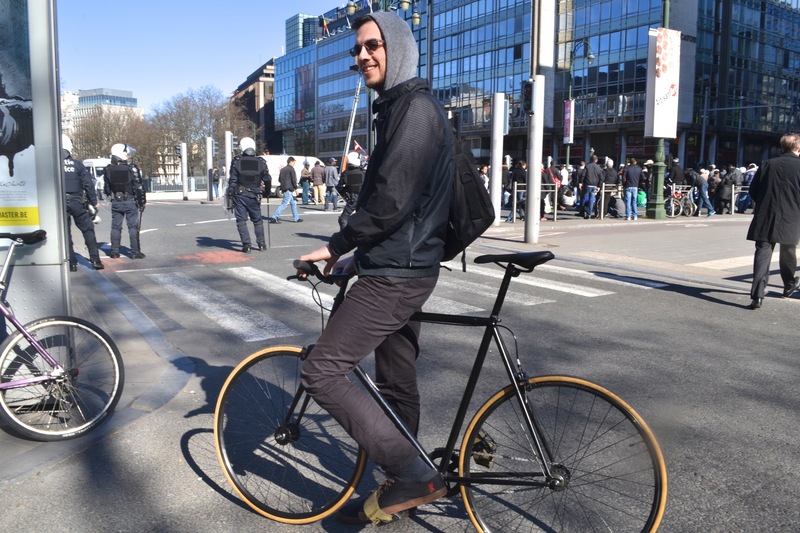 This entry was posted in advocacy, Europe, event, fixie and tagged 2015, March. Bookmark the permalink.